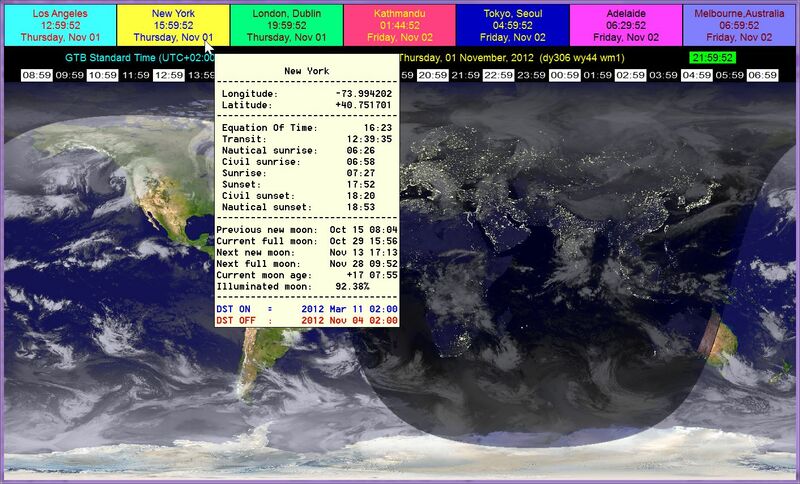 EarthSunX is a small program that will display very valuable information related to time and date all over the earth in a very pleasant / relaxing way and without taking any valuable desktop space or a lot of resources - yet being always less than one mouse move (or hotkey) away !!! Now in v3.40 with updated 'live' cloud-maps and also plenty of business features (like time calculations for reliably scheduling a web-meeting over a few timezones)! 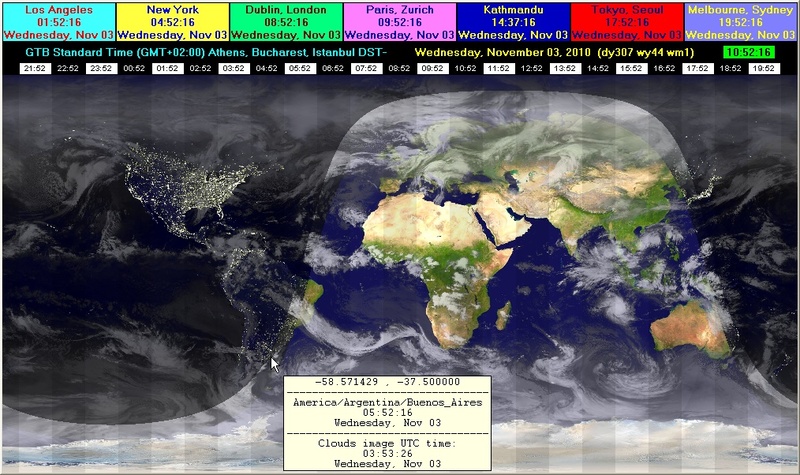 Also please note the shareware version now updates the clouds image less often than the registered one in order to conserve our limited bandwith. Also since v3.30 the tooltip will tell you when Daylight Savings Time is active and one week in advance when it will be activated / de-activated (independently on each city). Fonts and display scaling have been also better adapted for high-DPI-scaling. See here a screen capture with the tooltip showing in blue that DST was activated at that date and is still active, and in red that DST will end at the specified date. Order the registered (never expiring) version of EarthSunX from MyCommerce (formerly ShareIt). (volume discounts are now available; existing registered users can order much cheaper updates using this link; also please note that EarthSunX is now part of our top suite - Desktop-Enhancing Utilities). Please note that v2 will take advantage of the latest timezones definitions in Windows, however you should be aware that Microsoft only automatically updated those in Windows XP (and Vista) and with the older versions of Windows you might have to manually edit things in registry or with TZEDIT, or just save the correct registry key from an updated computer and import that file. Version 2.10 and newer will also fix some EarthSunX problems introduced by the December 2007 Microsoft TimeZone update. Version 2.20 will fix a crash in XP German with a certain set of Microsoft Updates that are currently retired but which many users have automatically installed. Also there is a fix for 'calculate for a specific moment' and some extra tooltips in certain dialogs to help picking the right timezone for a specific city. Version 2.30 will add millisecond display when activated with the <CTRL> or <SHIFT> pressed, and a sound mark when activated with both pressed, and a better way to calculate WY=Week-of-the-Year. Since version 3.00 a new option is available - CLOUDS ON/OFF - that option is disbled by default, but when you activate it EarthSunX will fetch the most recent 'live' cloud-map from the internet and use it to calculate a very realistic view of the Earth! 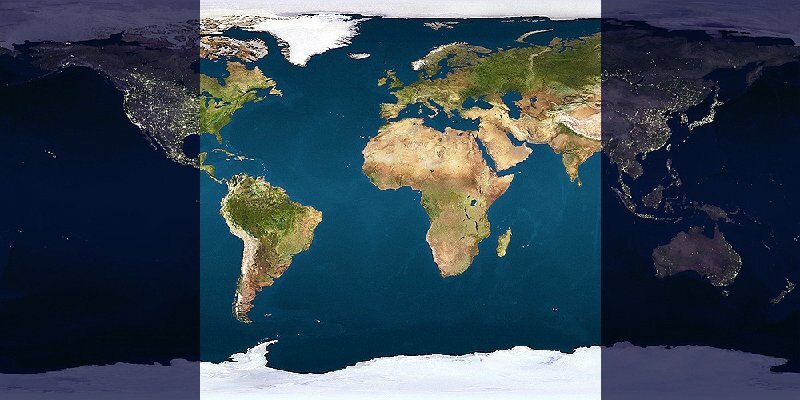 EarthSunX will auto-hide itself when the mouse pointer is no longer over it and will un-hide when the mouse is positioned for a short time over its thin margin on the edge of the screen (you can accelerate that with a click on it) or when pressing the special hotkey (WIN+K by default). A double-click will also hide the EarthSunX window (in case you do not want to move the mouse from that position since you want to get to some windows under EarthSunX). EarthSunX is entirelly self-contained and requires no special framework to be installed - and also does not require a link to the Internet - everything is based on your computer! (but some "local settings" MUST be correctly set, like for instance the time and time-zone - if you time-zone is NOT set correctly the picture will not be correct - you will also be able to see when you have such a problem since on the row with the local time the name of the time zone will probably be wrong). 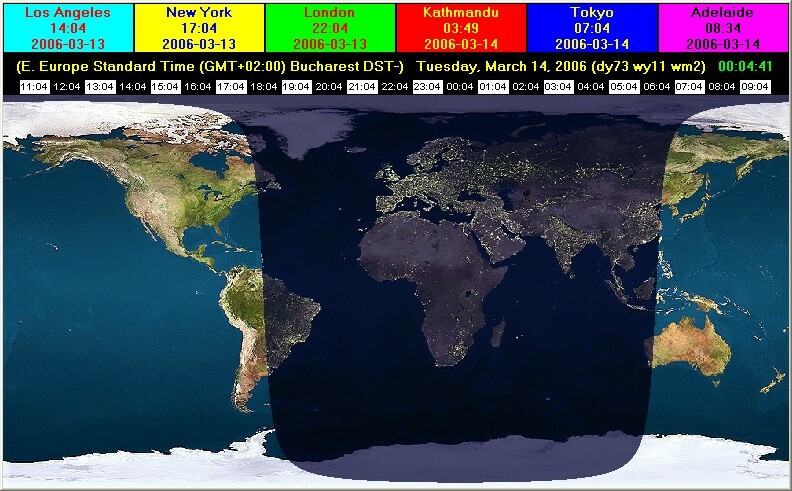 EarthSunX will use the time-zones defined by Windows itself - which might be different in various versions of Windows and not necessarily accurate - for instance only Windows versions after 2000 will know that Nepal/Kathmandu is in a time-zone that is 45 minutes away from multiples-of-GMT (but most Windows versions will recognize most zones with 30 minutes offsets). EarthSunX works on Windows 95, NT4, 98, 98SE, ME but for best results Windows 2000 or Windows XP (with the latest service packs) and a screen with 15bpp, 16bpp, 24bpp or more are RECOMMENDED! Also now EarthSunX works on Vista and Windows 7, and on both 32 and 64 bit Windows. There are many settings that can be changed for EarthSunX and in the current version most of them from the EarthSunX Menu that you activate with a right-click over either the EarthSunX main window or the small EarthSunX tray icon. - save the current configuration or reset it to the default one. Even if the map is calculated into a background thread (and no more often than once in 2 minutes or so - depending on your screen resolution when the shadow moves with more than a pixel), in case you have a very slow computer you might want to check the speed with the "Hour shadows OFF" and one of the first two shadow modes since that can be more than ten times faster !!! (you can also enable less frequent recalcuation overall or only when running from batteries). - local time (in black on a light-green background). 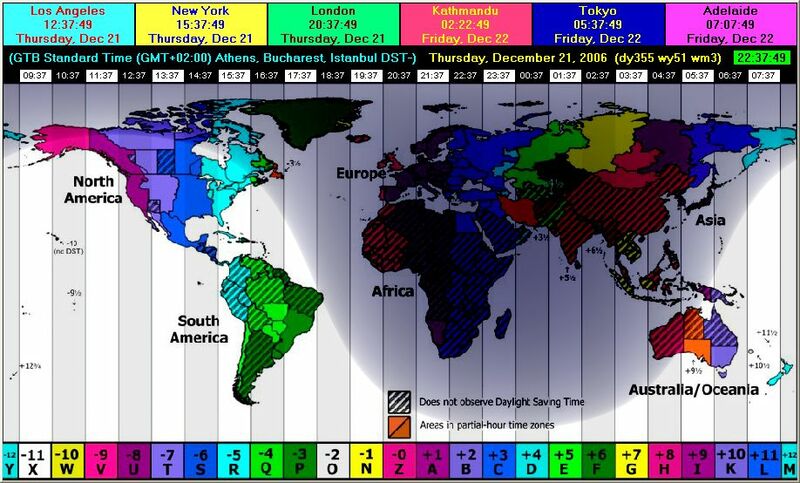 EarthSunX requires that the TIME and TIMEZONE on your computer are set correctly!!! You can set both the TIME and the TIMEZONE from Control Panel -> Date/Time. You can also use more advanced tools for automatically synchronizing the TIME over the Internet - for instance AboutTime or NTP. Clouds history animation medium and large! 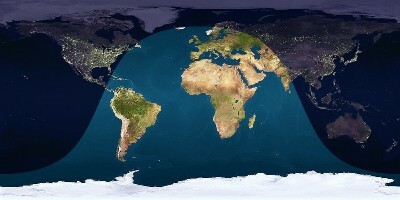 EarthSunX with 'live' clouds, hour-zones shadows, twilight zone and tooltip. Sunrise / Sunset / Moon-phase information. EarthSunX with hour-zones shadows, twilight zone and tooltip. EarthSunX with simple day/night view. 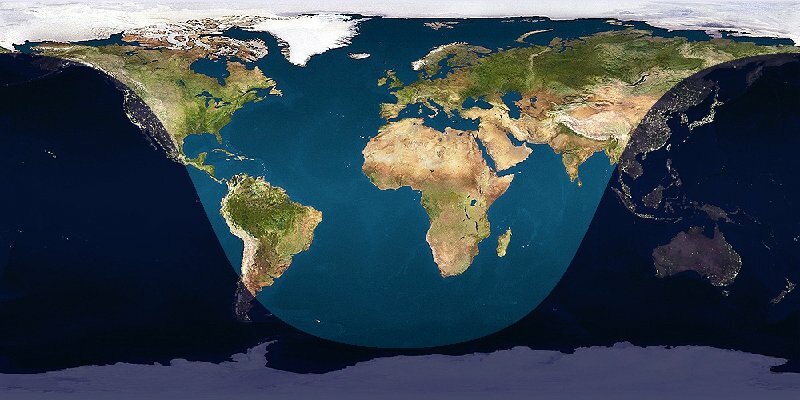 Simulated day/night image on the equinox. Simulated day/night image on the summer solstice. 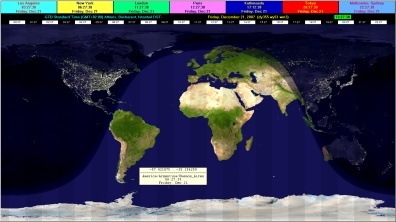 Simulated day/night image on the winter solstice.